The Tunturi R30 Rowing Machine is your gateway to a new you, rowing activates almost all of your major muscles in one fluid motion to burn calories and shred away fat quicker than biking or running could ever hope to. The R30 isn’t a complex machine it has a simple battery powered LCD console to provide important workout feedback, and you can simply jump on and start rowing making it extremely easy for anyone to use. Just below the console is a holder for a tablet so you can keep well entertained whilst you train. The R30 uses a magnetic resistance system that operates from a 4kg flywheel which keeps the rower silent and feeling smooth, it also enables 8 resistance levels to vary the intensity of your rowing, these can be easily adjusted with the twist of a dial. Rowers are generally quite long so you can fold the R30 up in seconds with a spring loaded release pin to reduce the length by half! This doesn’t hinder the durability however as it can still hold up to 15.7 stone. 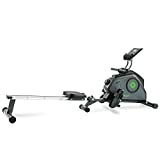 This entry was posted in Fitness Products and tagged Cardio, Dark, Folding, Grey/Green, Machine, Marcy, Regatta, rowing, Tunturi, Unisex by Summer 365. Bookmark the permalink.